I am not to sure if this is possible? What I am looking to do is. 1 - I have polygon and point data. I want to use the polygon to select the point data that falls within in the radius of the polygon. 2- The point data has attributes linked to a common id. I want to then extract the lowest value from that common ID then place it into a field in the polygon. Then I want to add Field 1 and 3 to the polygon. 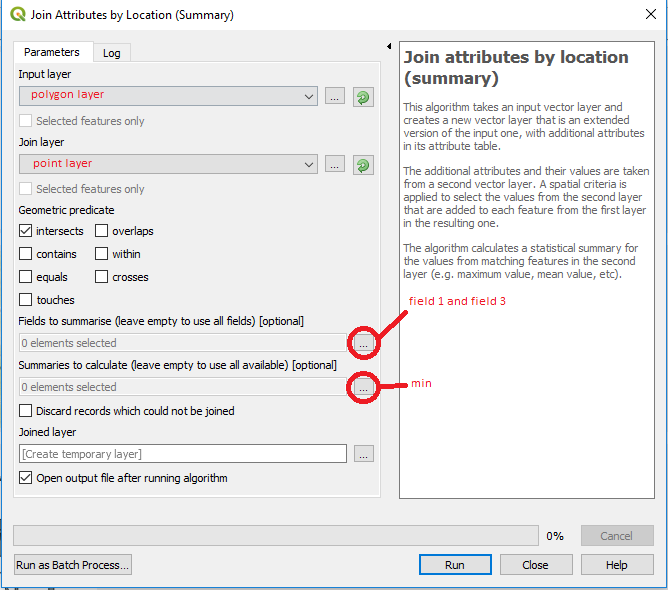 Use the Join by Location (Summary) tool with the "min" summary type. For points that fall within each polygon, this tool will add the minimum values from fields 1 and 3 to that polygon. It creates a new layer, which by default is a temporary layer. Be sure to save the temporary layer as a permanent layer before closing the project. Is there a QGIS alternative for ArcMap's Append (to Shapefile) Data management tool? Renaming non-GIS files through QGIS? Writing QGIS field calculator formula?